The predominant structural steel sizes can be found here which wide flange sections and properties that use during beam design process to select steel beam sizes for floor or roof beam. The other structural steel beam dimensions, square steel tubing can be found here or for rectangular steel tubing click here These pdfs are the same steel beams sizes used by steel mill and retail steel warehouse for steel I beam prices or structural steel prices. Steel angles, pipes, and channels are also part of structural steel but in most cases are more in supporting role. For example, floor framing beams and girders are mostly wide flange or I beam that spans 30 feet to 50 feet depending on the architectural or serviceability need of the structure. Between those long spans there are purlins mainly to cut down the spans to meet metal deck span requirements. Due to the span of 30+ feet long the wide flange suited the job best. Between those purlins there may be a need for drainage pipes to pass thru the floors down to the ground. To allow the drainage pipes penetrate thru the slab will require additional frames to strengthen the metal deck and the concrete floor. This is where smaller steel members such as steel angles and channels come in handy. 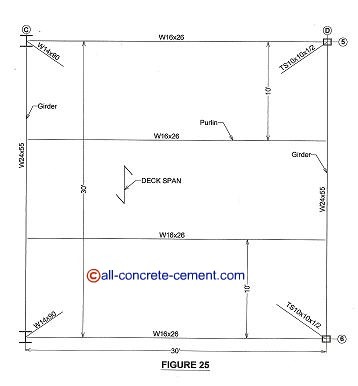 For 10 feet span between purlins, two C8x11.5 steel channel may be used along with two angles that can span between the two channels to form the hole. Working with floor penetrations on design-built projects can be very challenging because the information to locate the floor penetrations may not be available at the time the steel detailing was done. In such incident, the only thing to do is install the extra steel in the field. The pressure for time in following aggressive schedule as most construction projects do, the information may not be available till after the concrete is poured and the steel frames fireproofed. Once the composite decks are poured, other trades such as metal stud framers, electrical and mechanical contractors are in doing their respective work. This was exactly what happened on a 12,000 ton structural steel project I worked on.